Download the PDF version (270 KB) of this content. This Labour Market Bulletin provides an analysis of Labour Force Survey results for the province of Saskatchewan, including Regina-Moose Mountain, Swift Current-Moose Jaw, Saskatoon-Biggar, Yorkton-Melville and Prince Albert & Northern economic regions. Just over 569,000 people were employed in Saskatchewan in the third quarter of 2018, 2,100 more than the previous quarter. Both full- and part-time employment increased during this period, by 800 and 1,400 respectively. The private sector led employment gains, adding 4,800 positions in the third quarter of 2018. Meanwhile, public sector employment remained virtually unchanged during this period (-100), while the number of self-employed Saskatchewanians dropped 2,600 in the third quarter. The number of individuals actively looking for employment increased 1,100 in the third quarter. The provincial unemployment rate now stands at 6.6%, up 0.2 percentage points from the previous quarter. Saskatchewan's rate exceeded the national average of 5.9% during the same period, and was the second highest in Western Canada after Alberta (6.8%). After two consecutive quarterly increases, the unemployment rate for young men (15 to 24 years) dropped one-full percentage point to 15.4% in the third quarter of 2018. In contrast, the unemployment rate for young women rose from 8.7% in the second quarter to 10.4% in the third quarter. In the third quarter of 2018, the total population aged 15 and over in Saskatchewan was 885,400. The Indigenous population living off-reserve accounted for 9.8% of that, or 86,400 people. Employment among the Indigenous population in Saskatchewan stood at 46,000, representing a marginal increase of 100 positions (+0.2%) from a year earlier. The increase was driven entirely by a rise in the number of part-time positions (+500 or +6.8%) but mostly offset by a loss of 400 full-time positions from the year previous (-1.0 percentage point). The unemployment rate among the Indigenous population was 16% in the third quarter of 2018, an increase of 2.3 percentage points from the previous year. Among the non-Indigenous population, the unemployment rate was 5.7% (+0.2 percentage points). Between the third quarter of 2017 and the third quarter of 2018, the participation rate of the Indigenous population was 63.4% (+0.9 percentage points) while among non-Indigenous population, it was 70.2% (-0.2 percentage points). The employment rate for the Indigenous population was 53.2% (-0.7 percentage points) and the employment rate for the non-indigenous population also decreased, to 66.2% (-0.3 percentage points). Notes: The Labour Force Survey excludes those living on-reserve. Estimates are based on three-month moving averages. Source: Statistics Canada Labour Force Survey - ESDC custom table. Considerable gains in services-producing industries (+3,900) overshadowed losses in the goods-producing sector (-1,800) in the third quarter of 2018. This is consistent with what happened on an annual basis. Year-over-year employment was up 4,100 in with the services-producing sector, while employment in the goods-sector was down 3,100. The number of people employed in educational services increased considerably this quarter (+2,400). The 2018-19 school year has started and school divisions across the province have hired more teachers and support staff due to an increase in student enrolment. The Regina Public School Division has added 23.5 full-time-equivalent (FTE) teachers and 16.5 FTE educational assistants. Meanwhile, the Regina Catholic school board has hired an additional 20 FTE teachers and 2.6 education support staff. Similarly, the Saskatoon Public School Division has hired more than 21 new teachers and over 18 full-time educational assistants. Likewise, the Saskatoon Catholic division has appointed an additional 37 teachers and 19 education assistants. 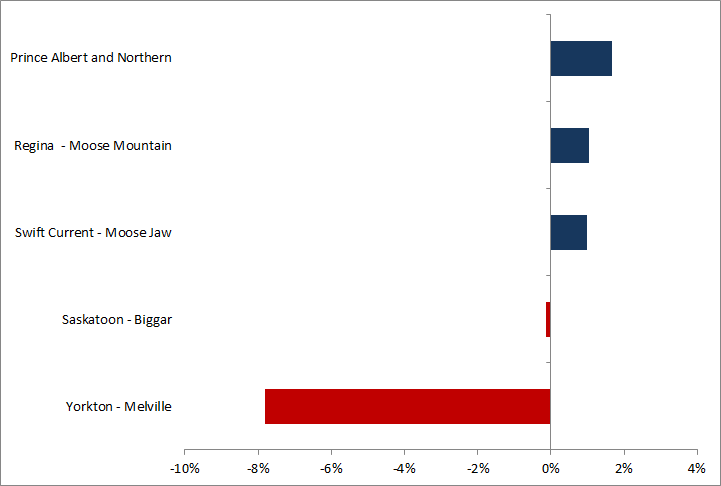 Year-over-year employment was down in Saskatoon-Biggar and Yorkton-Melville economic regions in the third quarter of 2018. 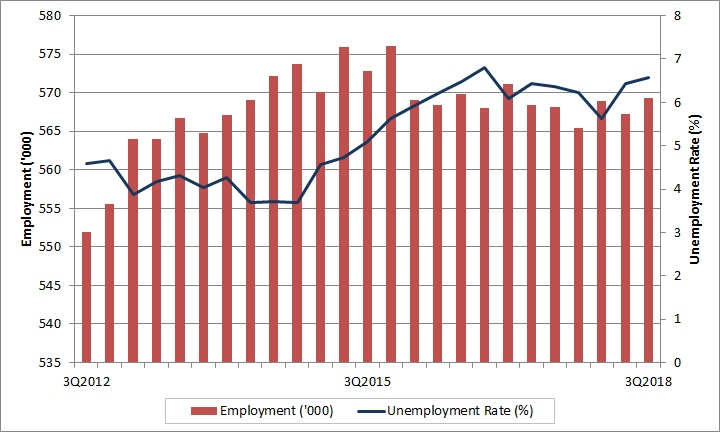 Meanwhile, the unemployment rate increased in three of the five economic regions during this period. Prepared by: Labour Market Information (LMI) Directorate, Service Canada, Saskatchewan. For further information, please contact the LMI team. For information on the Labour Force Survey, please visit the Statistics Canada website. Canadian Federation of Independent Business (September 27, 2018). Business Barometer. The Conference Board of Canada (September 5, 2018). 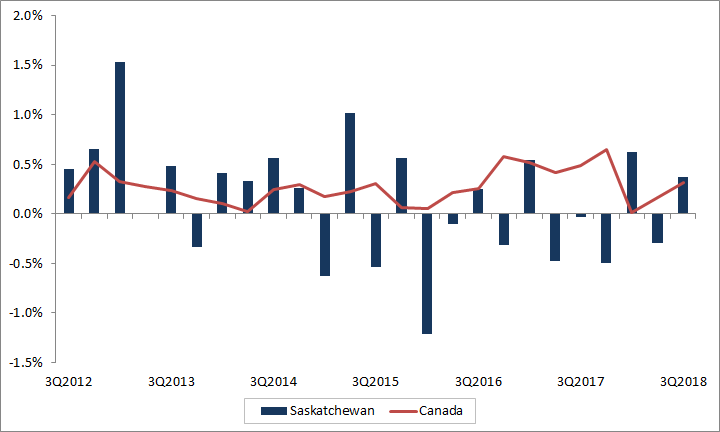 Provincial Outlook Economic Forecast: Saskatchewan-Summer 2018. Global News (July 25, 2018). Cameco permanently laying off around 700 workers. Estevan Mercury (August 2, 2018). PSAC forecasts 503 fewer wells for Saskatchewan. JWN (August 22, 2018). Interest building in Saskatchewan helium drilling . SaskPower (July 9, 2018). 2030 Emission Reduction Goal Progressing. Blue Hill Wind Energy Project (June 6, 2018). Environmental Impact Statement. Global News (September 20, 2018). First large-scale wind power plant approved in Sask. CBC News (September 20, 2018). Sask. government approves wind turbine project near Herbert. Algonquin Power and Utilities Corp. Blue Hill Wind Project. Regine Leader-Post (September 20, 2018). Saskatchewan approves new wind energy project with 56 turbines. CTV News Regina (September 18, 2018). Local pot retailers hashing out details as legalization looms. MYLLOYDMINSTERNOW (September 16, 2018). Saskatchewan cannabis retailer looks to hire locally. EVRAZ (April 7, 2017). Docket Number 170309252-7252-01, "Construction of American Pipelines" (82 FR 8659): Submission of Evraz North America. Global News (March 31, 2015). Evraz North America investing $200 million in Regina plant. Times Colonist (August 21, 2018). U.S. to impose anti-dumping duties of 24% plus on Canadian-made pipe. Financial Post (August 21, 2018). U.S. to impose anti-dumping duties of 24% plus on Canadian-made pipes. CBC News (August 21, 2018). U.S. to impose anti-dumping duties of 24% plus on Canadian-made pipes. CBC News (August 23, 2018). Steelworkers rep calls new U.S. tariffs a 'straight attack' on Regina's Evraz operations. CTV News Saskatoon (September 14, 2018). Grand opening for 'Bridging to Tomorrow' project set for Oct. 2. The Conference Board of Canada (June 5, 2018). Metropolitan Outlook 1: Saskatoon-Spring 2018. The Canadian Mining Journal (October 16, 2017). POTASH: PotashCorp completes Rocanville expansion. CBC News (September 5, 2018). Northern Saskatchewan schools short 14 teachers this year and feeling the pinch. CTV News (September 7, 2018). Northern Saskatchewan faces 'unusual' teacher shortage. Saskatoon StarPhoenix (September 17, 2018). 'How am I going to do this?' Sandy Bay school adapting in light of teacher shortage.